These interventions work across three main levels in order to challenge narratives and influence systemic change. 1. Practice: working intensely with communities on a grassroots and local level. This includes working with young men in East London, NW London and Leicester, and workshop programmes with schools in East London. 2. Policy: influencing at a strategic level, based on our work at a local level. Our initial work with MCP was picked up by the Young Review and as a result of this we have been commissioned by Barrow Cadbury to undergo a scoping exercise to ascertain how prosecutors can be more suitably equipped to deal with young Muslim men who come into contact with the CJS. 3. Public imagination: Influencing, and where possible shaping, public debates and media narratives. 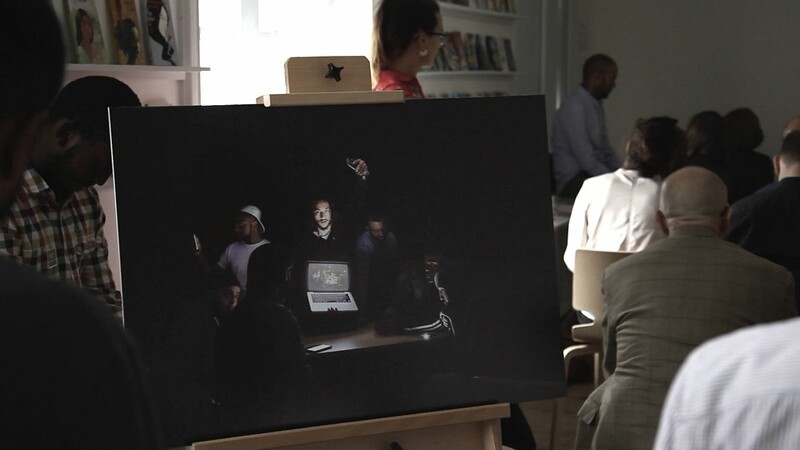 We worked together with artist Hannah Habibi, to recreate a landmark painting - Joseph Wright's 'The Experiment' with young men from Mile End. 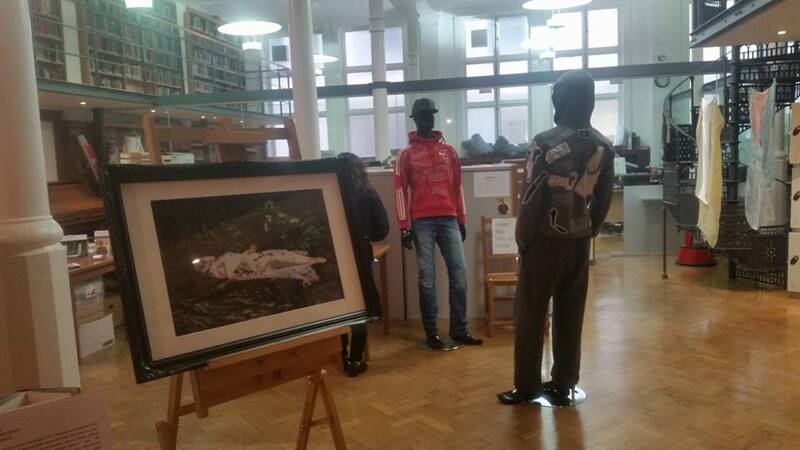 We also worked with photographer Wasi Daniju to recreate a work of German expressionist art with young men from Leicester. These workshops really helped advance our school work and opened our eyes. The sessions brought over the real issues in the world - I have a new goal now, to make a change in the world, just like Maslaha are doing now! During our first year of research with the Mile End Community Project (MCP), group members flagged up their early teens as a time when a constructive intervention could have been beneficial in shaping their aspirations. In response to this, in the second year of the project we worked with two schools based in Walthamstow, East London, to build lesson plans seeking to raise aspirations of young men, focusing on practical learning. We devised flexible blocks of workshops in response to each of these two challenges, which could be tailored to be run with Year 7-10 pupils. 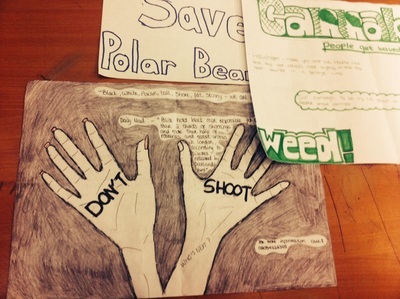 The two groups of pupils we piloted the workshops with were very different. 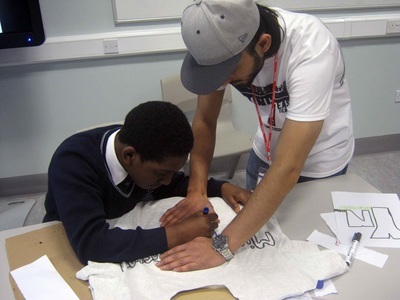 On both occasions, AK, who is now running his own creative initiative as a result of participating in this project - http://www.akreativeproject.co.uk/ - assisted with the planning and delivery of the workshops. AK not only brought creative input and ideas, but as a person who felt let down at school - he spent time in Pupil Referral Units (PRU) and was excluded from school just before his GCSE’s - he was an inspiring role model for young people to be introduced to as somebody who had overcome personal challenges, as well as being conscious of wider issues and discrimination that had contributed to these challenges. A set of four entrepreneurship workshops with a Year 9 Citizenship class in Kelmscott School. The sessions covered a number of areas including: working with diverse networks of people, learning how to identify skills and raising aspiration, creative problem solving, exploring existing skills and attitudes, understanding how to set up/run a social enterprise, research and pitching skills and thinking locally and globally. 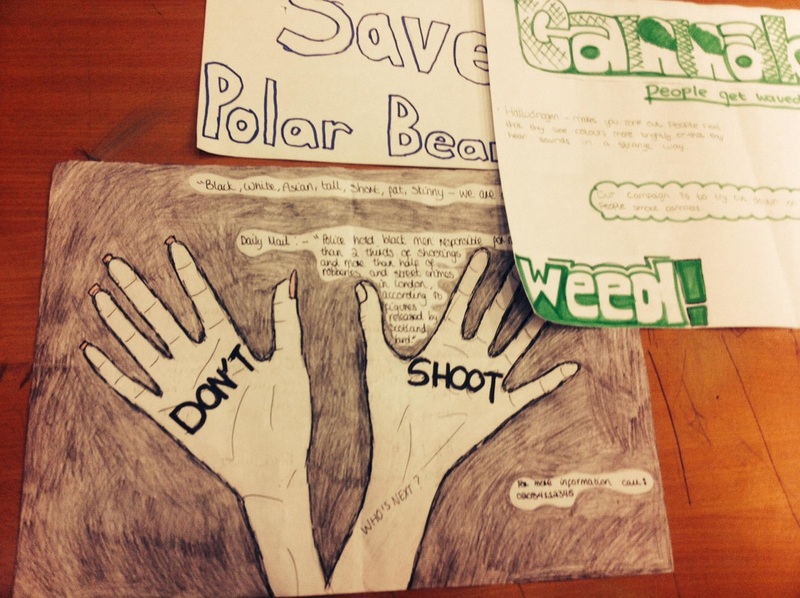 Pupils split up into groups of six and each selected a social issue and came up with a campaign to tackle their issue in a way that could also make money. Topics chosen included: Stop and Search, internet privacy, global warming, cannabis use and institutional racism. In the final session each group ‘pitched’ their campaign ideas - using posters, power point presentations and role plays - to a panel of experts consisting of Maslaha team members, AK and a representative from the Pears Foundation. It was easier to describe our feelings with art than having to speak about them. The Key Stage 3 ‘Fresh Start’ class at Frederick Bremer provided us with an opportunity to work with a group of pupils many of whom were experiencing similar challenges to those that the MCP group struggled with at school. 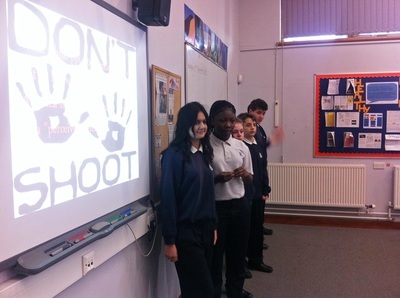 The class is made up of pupils who are at risk of being excluded from school or sent to Pupil Referral Units (PRUs). The nature of the ‘Fresh Start’ classes means the group of pupils is highly transient. The group, of between 7-10 pupils, changes every week as students join, or leave – either to return to normal classes, be sent to a PRU, or excluded from school. In light of this we decided to deliver a focused set of three sessions, which would also be relevant to newcomers who joined in later sessions. The sessions would also be highly interactive and tailored to the kinaesthetic learning style that many of the group had been previously observed to respond well to. The session activity was inspired by a collaborative art project ‘Inside/Out’ from AK and the artist Hannah Habibi Hopkins, who met earlier in the All We Are project. 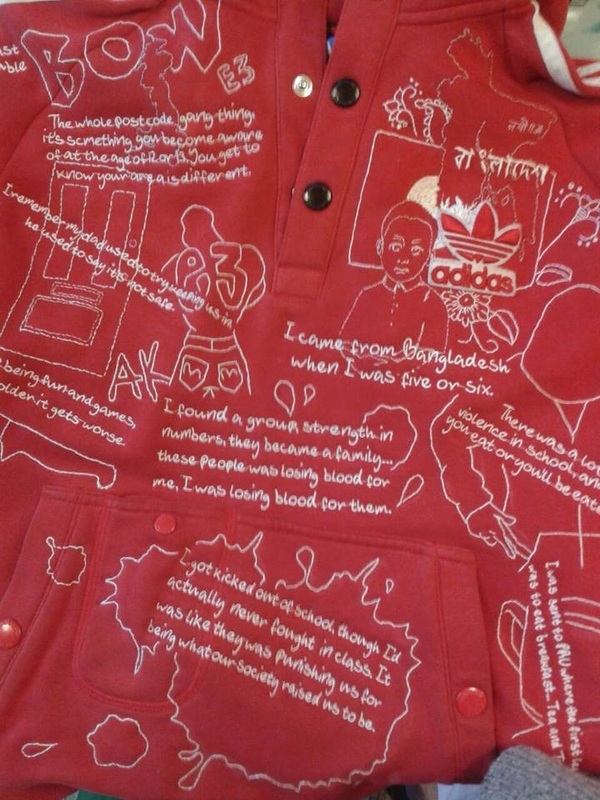 Inside/Out was a response to AK's and Hannah’s experiences of being reduced to the sum of their outward appearances and consists of re-forming street wear as a form of autobiography, encouraging the viewer to engage with the individual inside the clothes. 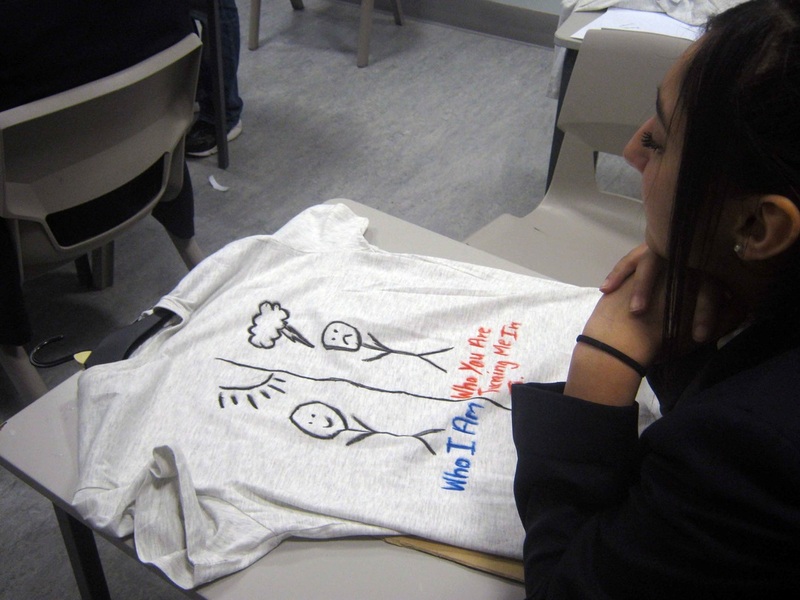 ﻿Inspired by the ‘Inside/Out’ approach, we decided to use t-shirt design as a way to capture pupils’ stories and provide them with the opportunity to think about their lives on their own terms. Pupils shared ambitions, challenges and thoughts about themselves that other people might not know or expect of them. opportunity to explore using creative techniques as a powerful mode of self-expression. ﻿﻿﻿﻿​Change in policy and practice in recent years to the effect that ‘lack of maturity’ is seen as a mitigating factor in sentencing decisions for adults, has raised the question of what other factors might be relevant for sentencers to consider at this stage. Muslims in the UK suffer disproportionately from inequalities in areas such as health, underachievement in the education system, employment, and negative media coverage. This project has shown the considerable bearing these inequalities have in the lives of young Muslim men at risk of entering the CJS. Our research has shown us that for many reasons, magistrates may not have an objective layered view of the complex issues which affect a young Muslim man. This scoping exercise, through the process of a series of interviews with a range of statutory bodies - including judges, academics, police, magistrates and young people in London and Leicester, will identify specific resources focused on the distinct needs of young Muslims that would be of benefit to decision makers. We published the findings of this research in a report in March 2016, laying out a series of recommendations proposing multiple interventions that we believe could lead magistrates to have a broader, more contextualized image of a young Muslim’s life. The issue of stereotyping is a recurring one when it comes to young Muslim men. The findings of the Young Review indicated that Muslim men are impacted negatively by stereotyping at every level of the criminal justice system, from 'stop and search' by police officers, to sentencing, probation and treatment by prison guards. Changing public narratives is an important step to beginning to break down such stereotypes. We made this the focus of an event we held as part of the Unusual Suspects festival in September 2014, exploring unlikely connections in social change. Our session, which showcased the findings of our first year of work with the Mile End Community project, focused on how existing community assets can be strengthened to tackle issues facing young people at risk of entering the criminal justice system. 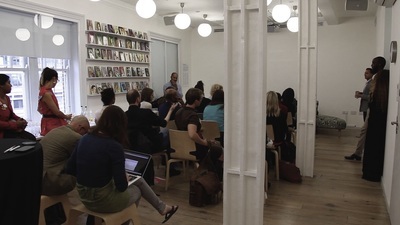 The event, which was held in Whitechapel Gallery and covered by the BBC Asian Network, included a panel discussion with AK, one of the group; Nurull, one of the leaders of the Mile End Community Project; Jess Mullen from Clinks; and Simon Fulford, director of Khulisa. 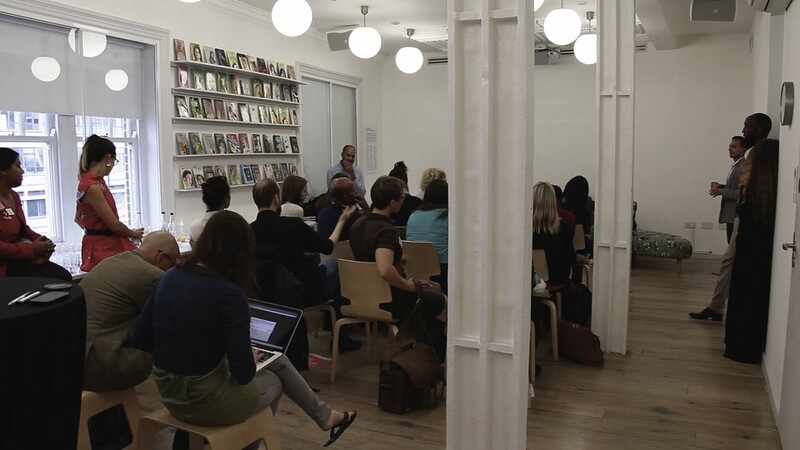 We had extremely positive feedback particularly on the style of the event, the range of panelists, the use of creativity to widen language, and the potential to set practical change in motion. ​You can view more images from the event and the process of creating the image here.